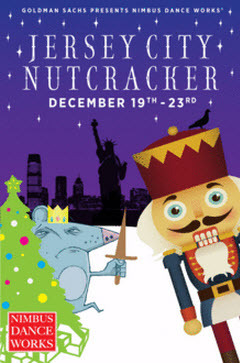 Tix On Sale NOW for Jersey City NUTCRACKER! Nimbus Dance Works announces the third year of the company’s annual holiday tradition: Jersey City Nutcracker. Jersey City Nutcracker tells the story of two children’s urban holiday adventure leading them through fantasy, adversity and celebration and teaching them lessons about friendship and community along the way. Choreographed and directed by Nimbus Artistic Director Samuel Pott, this adaption of Tchaikovsky’s holiday classic is performed by a stand-out cast of professional dancers from Nimbus Dance Works joined by youth and adults from the community as they portray familiar characters such as the Sugar Plum Fairy, the Rat King, the Arabian Princess and Drosselmeyer all with a Jersey City twist! Amidst colorful sets, costumes, a brightly adorned tree, youth and adults alike are touched by this tale of Christmas spirit. The 2012 edition features new sets and costumes. And for last minute holiday shoppers: Not Yo Mama’s will present a pop-up gift boutique in the lobby of the performance with unique, handmade items for sale. Plus: surprise guest-performers make unforgettable cameo appearances Stay tuned! 2012 Jersey City Nutcracker performances will take place at the state-of-the-art auditorium at Frank R. Conwell Middle School #4 and will involve youth performers drawn from schools and dance studios throughout Jersey City including: the School of Nimbus Dance Works, Jersey City Dance Academy, Next Step Broadway, Henry Snyder High School, Middle School #4, St. Dominic Academy, and many others. “Spirit of Community” Cathedral Arts Festival Opens Tomorrow!